Left to right: Stephen Michael Spencer, Rodney Gardiner (kneeling), Armando Durán, Danforth Comins. Photo courtesy Jenny Graham and the Oregon Shakespeare Festival. Shakespeare’s Julius Caesar has a misleading name. Although the Roman leader does play a significant role, and his assassination is what sparks most of its action, we never learn much about him or see him develop. Rather, Julius Caesar is an examination of political ambition, public opinion, and how the worst acts are often paved with good intentions. Shana Cooper’s bare, unsettling production strips away the formal veneer of ancient Rome to expose the action as men committing acts of horrific violence for unclear reasons. Armando Durán portrays the role of Caesar in this production. 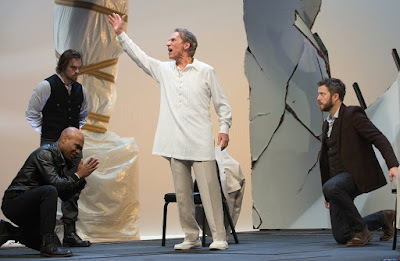 His interpretation is very different from that of Vilma Silva, who played the same part in OSF’s 2011 production: While Silva was composed and quiet, Durán has a casual, Reaganesque charisma that makes it easy to see why the Roman public adores him. Vaguely aware of the plot to assassinate him, Durán’s Caesar resigns himself to his fate: He accepts that Caesar the public figure is something that has eclipsed Caesar the man, and that his death is no longer anything over which he has control. The objections of Calpurnia (Amy Kim Waschke), his wife, complicates the topic, however: As her sincere, emotional dialogue work correctly notes, Julius Caesar is still a human being, regardless of where history has seated him. After Ceasar is assassinated, war ignites between loyalist Mark Antony (Jordan Barbour) and the turncoat senators led by Marcus Brutus (Danforth Comins) and Cassius (Rodney Gardiner). Barbour’s emotional interpretation of Antony, combined with our perspective of the events mainly coming from the senators, leads one to believe that he is strong but straightforward; however, his famous “Friends, Romans, countrymen” speech is so terrifyingly persuasive that it undoes not only the hold the Senators had on the common people, but the audience’s conception of Antony himself. Cassius has the clearest conscience about killing Caesar, but because the audience is never given a clear vision of Caesar’s actions, we don’t know if this is a mere power play or done out of some kind of conviction. Rodney Gardiner’s performance leads us to believe Cassius’ motives are more on the selfish side, as his preparations for the killing are tinged with an almost innocent enthusiasm. Comins’ Brutus is a fairly standard handling of the role – a conflicted man who doubts his actions from the start of the play – but his performance is heartfelt and powerful. Sibyl Wickersheimer’s set, and Cooper’s direction of the Roman public, is what gives the play new meaning. The set is somehow both sterile and destroyed, making use of wooden slats, folding chairs, and a statue covered with cloth and packing tape. The members of the public caper about dressed in Greek chorus masks, reminiscent of a gang of cannibals in a Mad Max movie. Nothing we are presented onstage implies that ownership of the Roman empire or of the hearts of the people has any value whatsoever, and that the entire course of the play is a series of pointless acts of violence. Julius Caesar at OSF’s 2017 season strips away the majesty of ancient Rome from the story of several people who murder thousands for vague reasons. It’s a filthy, bleak, depressing rendition that reveals more about Shakespeare’s original text than any production draped in togas. Julius Caesar runs until October 29th.